VATICAN CITY (CNS) — Declaring four 19th-century women religious saints, Pope Francis said they are models for all Christians of how faith, nourished in prayer, is expressed concretely in acts of charity and the promotion of unity. 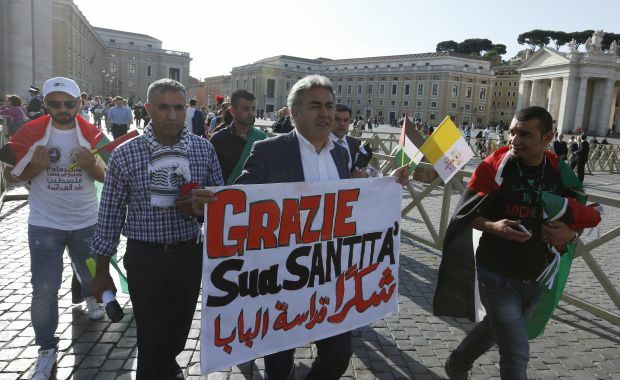 The new saints, proclaimed during a Mass May 17 in St. Peter’s Square, included two Palestinians — Sts. Marie-Alphonsine, founder of the Rosary Sisters, and Mary of Jesus Crucified, a Melkite Carmelite — as well as French St. Jeanne Emilie de Villeneuve and Italian St. Maria Cristina Brando. Pope Francis gave Abbas a medallion depicting the “Angel of Peace” and said he hoped Abbas would be that angel of peace for his people. Peace and understanding were also key elements in Pope Francis’ homily during the canonization Mass the next morning. “Pray to the two new saints for peace in your land so that this interminable war would end and there would be peace among nations,” the pope told them. “And pray for the persecuted Christians, those chased from their homes and land,” as well as for victims of “white-glove persecution,” those discriminated against because of their faith. The four women saints, the pope said in his homily at the canonization Mass, were shining links in the chain of witnesses to Christ’s resurrection, offering their testimony not primarily through their words, but through their actions of love. “This love shines forth in the testimony of Sister Jeanne Emilie de Villeneuve, who consecrated her life to God and to the poor, the sick, the imprisoned and the exploited, becoming for them and for all a concrete sign of the Lord’s merciful love,” he said.